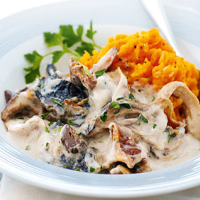 Mushrooms sautéed with vintage cider make a tasty vegetarian alternative to beef in this low fat version of a classic dish. Heat the oil in a deep frying pan and sauté the onion for 8-10 minutes until starting to soften. Add the garlic and mushrooms, season and continue to sauté for 4-5 minutes, until the mushrooms have softened. Add the cider and bring to the boil, then reduce the heat and simmer for 5 minutes to reduce slightly. Blend the cornflour with the mushroom ketchup until smooth. Remove the mushrooms from the heat then add the ketchup and yogurt, and stir to combine. Warm over a low heat until slightly thickened and piping hot. For a more indulgent version, use soured cream instead of the yogurt. You could also replace the cider with apple juice, if you prefer. This recipe was first published in December 2007.